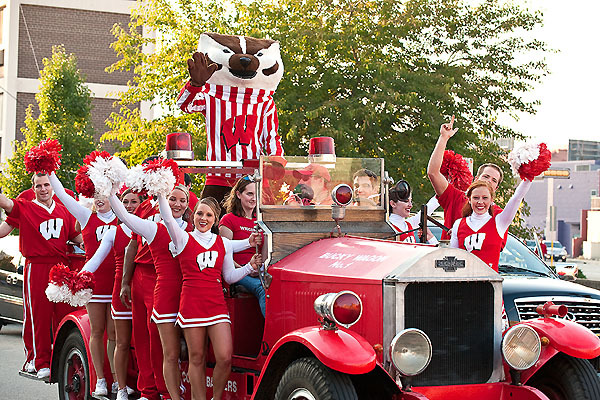 Welcome to the University of Wisconsin-Madison Bucky Wagon blog! The Bucky Wagon is an iconic UW-Madison symbol that carries Badger spirit across campus and throughout Madison on football Saturdays and for each year’s Homecoming festivities and parade. Until 2001, the Bucky Wagon was used on game days to carry the Spirit Squad into Camp Randall Stadium. Mascot Bucky Badger and cheerleaders from the UW Spirit Squad drive along Regent Street in the Bucky Wagon before a home football game. The current Bucky Wagon, which is the third vehicle known by the name, is a restored 1932 La France fire engine, donated by alumni to the Wisconsin Alumni Association (WAA) in 1971. Time has taken its toll on the Bucky Wagon, and it’s nearly impossible to find parts to repair and maintain the vehicle, so the WAA has paired with the College of Engineering to help the Bucky Wagon transition to the 21st Century as a safe, electric-powered vehicle with power hydraulic brakes and power steering. The renovation, which will preserve the vehicle’s exterior, wheels and hubcaps in order to maintain the iconic appearance of the wagon, will be done by engineering students under the guidance of Mechanical Engineering Faculty Associate Glenn Bower. Bower leads the six college vehicle teams, have been victorious at 16 different international automotive competitions since 1998. The teams are currently raising money for an endowment fund to ensure future students have the opportunity to learn and implement innovative vehicle design. More information about this will be posted soon. Along with covering the Bucky Wagon renovation step-by-step, this blog will also feature stories and profiles about the vehicle team students and projects. Starting October 13, be sure to check back for weekly, in-depth looks at what it takes to turn a red fire engine green!